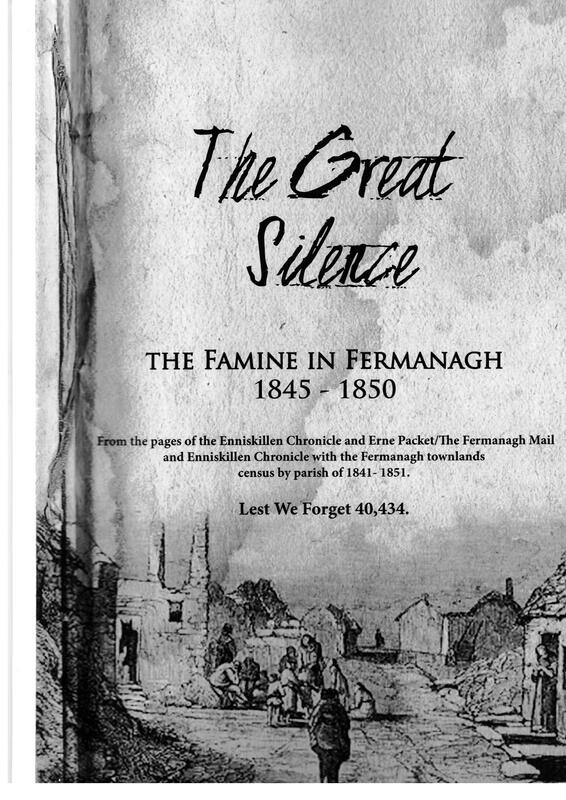 The Great Silence – The Famine in Fermanagh 1845-1850. Book Launch. conversation gone forever. Those lucky to have got away to the corners of the world will never return. In little over a period of five years famine, disease and emigration swept away over 40,000 Fermanagh people; (more than two-thirds of today’s county population). In these pages we hear the voices of the people of the time tell of life and how it was in the words of the time in a local Fermanagh newspaper. Few things have brought more distinction to the name of Ayrshire than the county’s breed of dairy cattle. The Ayrshires have brought prosperity to the land of their origin and proved their worth in most dairy farming areas of the world. For over 150 years they have been one of the best all round dairy breeds and have shown their adaptability to a wide variety of climates and conditions. The distinctive and pleasing appearance of the Ayrshire has made it easily identifiable, even to the layman, be it on the pastures of its native county, the prairies of Canada or the green fields of New Zealand. Unfortunately, the modem practice of dehorning has robbed it of its crowning glory. The breed as we know it is not indigenous to the county, indeed, it bears little resemblance to the cattle kept by Ayrshire farmers of 250 years ago. The native breed was small and stocky, their rough coats were black, black and white or dark brown in colour, and their meat and milk production was poor. Until the middle of the 18th century, the countryside of Ayrshire was very much in its natural state. The soil was wet, cold and badly cultivated; it seems incredible that manure was not commonly applied to the land in the county until the 1760’s. Agriculture as an industry did not exist and farming was conducted at little above subsistence level for the families engaged in it. The heavy horse was only starting to take over from the ox and wheeled carts to replace sledges. The inefficient state of farming meant that farmers were unable to produce enough fodder to allow them to keep a reasonable number of cattle through the winter months and each autumn all but a few breeding animals were slaughtered and their meat salted. In bad seasons, the few that were over-wintered were bled regularly, the blood being mixed with oatmeal to supplement the diet of the farmer and his family. Bleeding and calf production left the cattle permanently emaciated and never able to reach a reasonable standard of quality in themselves or their offspring. Large herds of cattle were unknown and milk production was not on a commercial scale. A few enlightened landowners encouraged new farming methods and began the transformation of Ayrshire into the excellent farming land of modern times. Crop rotation, soil improvement, new designs of plough, the planting of shelter belts of trees, the enclosing of fields with hedges and dykes, and improved animal husbandry were all promoted. Amongst the enlightened men to whom we are indebted were:- the 10th and 11th Earls of Eglinton; the 4th Earl of Loudoun; Alexander Fairlie of Fairlie Estate, Dundonald; John Dunlop of Dunlop; Bruce Campbell of Galston; General Stewart of Stair; John Orr of Barrowfield; Colonel Blair of Blair; the Oswalds of Auchencruive; the Boswells of Auchinleck; the Brisbanes of Largs; and Colonel Fullarton of Fullarton, Troon. Improvements in pasture land and fodder production allowed the keeping and over-wintering of more cattle and as part of the new attitude to farming, men began to develop better cattle. There can be no doubt that Fullarton was referring to the early stages of the Ayrshires. It appears that in the beginning they took their name from the parish of Dunlop or from the Dunlops of Dunlop, the local gentry who are known to have been involved in their improvement. In other parts of Ayrshire, they became known as Cunninghame cattle and, eventually, when their fame spread beyond the county, they were called Ayrshire cattle. In other words, the name became less localised as the breed spread out from its source. It is thought that over many years, the native cattle were crossed with cattle from Teeside and Holland. The introduction of mahogany and white colourings proves that cross-breeding took place but the most important factor in the evolution would be judicious selection and mating of stock by men of vision. Improvement would be a long, slow process and would take many generations of men, most of whom were from the same families, to produce the excellent animal we know as the Ayrshire. The layman is unlikely to appreciate the tribute that is due to the early breeders for having achieved the outstanding qualities of the breed, for having fixed the characteristics so uniformly, and for having set a standard of conformation that has been accepted for so long. By the end of the first quarter of the 19th century, the new Ayrshires were well established all over South-West Scotland, in Lanarkshire, Stirlingshire and the islands of Arran and Bute. By 1856, when a World Agricultural Congress was held in Paris, and pictures of the main cattle breeds of Europe were drawn for a commemorative booklet, one of the cows illustrated was an Ayrshire, showing that the breed was known internationally. Between 1850 and 1870, Paton of Swinlees, Dairy was the leading breeder of Ayrshires but several farmers in Kyle had begun to challenge the Cunninghame supremacy, namely, Wallace of Auchenbrain, Mauchline; Neill of Barleith, Hurlford; Baird of Garclaugh, New Cumnock; and Murray of Carston, Ochiltree. In 1877, the Ayrshire Cattle Herd Book Society of Great Britain and Ireland was formed and the Society ensured that all pedigrees of the breed were proved and registered. The name of the Society shows that the breed had become popular throughout the British Isles and by 1879 animals had been exported to North America arid Sweden. Before the end of the 19th century, more names had been added to the list of farms which had become famous for the quality of their herds, including Aikenbrae, Barboigh, Bumhead, Bumhouses, Changue, Craighead, Drumsuie, Gree, Harperland, High Tarbeg, Billhouse (Galston), Hillhouse (Kilmarnock), Hobsland, Mansfield Mains, Overton, Purroch and Townhead. World renowned herds of the 20th century include many of those already listed, plus Balig, Bargower, Brieryside, Brocklehill, Carnell, Dalgig, Humeston, Killoch, Knowe, Laigh Milton, Lessnessock, Muir, Pant and Wheatrig. Animals from these and other herds are still sought by breeders in every continent. Apart from the continuing, though admittedly diminishing, popularity of the Ayrehires in Britain and Ireland, there are still Ayrshire Breed Societies in 12 widely differing countries, namely, Australia. Brazil. Canada, Columbia, Czechoslovakia, Finland, Kenya, New Zealand, South Africa, U.S.A., U.S.S.R. and Zimbabwe. The breed is also popular in Japan and Ayrshire bulls have been exported to India. In recent years, several other breeds have gained popularity as dairy cattle, often to the prejudice of the Ayrshires. Even in their native county they have been replaced in many herds. It may be that in a time to come they will be relegated to the status of a rare breed. If that still unlikely scenario should ever come to pass, the Ayrshires and the men who established the breed will be entitled to places of honour in agricultural history. Undoubtedly, the Ayrshire has a proud place in the county’s heritage. Leave a comment Posted in Uncategorized Tagged Ayrshire cattle, Cunninghame Cattle.